Sound Productions, based in the Dallas, TX metro area was established in 1972 as a backline rental company for many major touring acts. Over time it began receiving requests for rental of PA systems, which then led to sales of pro audio products, and systems. Although it sells a broad range of products, Sound Pro is known in the industry as a premier console reseller. It has represented every major console manufacturer and is now a Roland Pro Audio reseller representing the new M-5000 console and extensive line of digital snakes, personal mixing, and multi-channel recording options. 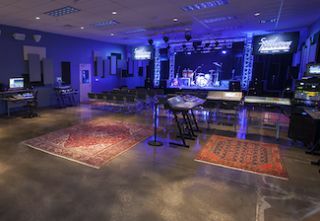 Above: Sound Productions showroom, training, and live demonstration room, Dallas, TX. Below (from left to right): Jeff Ballow, Highway Marketing; Charles Kitch of Sound Productions; Jeff Humphrey of Sound Productions; Scott Baker, Highway Marketing. Recently, Sound Productions opened its new showroom featuring the Roland M-5000 console. Customers can audition up to 12 consoles including the Roland M-5000 and any of the dozen speaker systems in the room by using a custom switch rack installed by Humphrey. The switch rack eliminates the need to re-patch and is a great way to easily demonstrate the M-5000 console in a live sound environment. The room is an active sound stage with a “live venue” feel. It also serves as a training facility with seating to accommodate up to 80 guests. Sound Productions offers regularly scheduled hands-on workshops and presentations throughout the year covering a broad range of topics and products. All of the workshops are offered free of charge as is a way for Sound Productions to give back to its customers and community. Scott Baker, president of Highway Marketing, is the local representative for Roland Professional Audio and Video products in the area. It was instrumental in getting the M-5000 integrated into the Sound Pro’s showroom and has brought a number of customers by to see the M-5000.